these two categories have been won at a Coupe Mondiale. The Confédération Internationale des Accordéonistes (CIA) was formed in Paris in 1935. The CIA runs the annual Coupe Mondiale World Accordion Championships which is held in a different country each year. 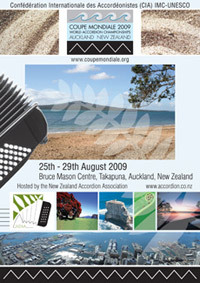 The 2009 62nd Coupe Mondiale was held in Auckland, New Zealand, August 25th-29th hosted by the New Zealand Accordion Association Inc.. The World Accordion Orchestra debut performance was at the 2007 Coupe Mondiale in Washington DC and the World Accordion Orchestra II performed at the 2008 Coupe Mondiale in Scotland, both under the Music Director/Conductor, Joan Sommers (USA). The CIA World Accordion Orchestra III which performed at the Finale Concert of the 2009 Coupe Mondiale World Accordion Championships, featured 147 players representing 14 nationalities. The conductors were Gary Daverne and Joan C. Sommers. Other eTracks listed above were from the Finale Coupe Mondiale concert. The only exception is the last track which was recorded from the Opening Concert of the 2009 Coupe Mondiale with the Auckland Symphony Orchestra.